OK, so it's pretty clear we're all doomed. We shall just have to grow accustomed to the fact that the sea is full of nightmarish monsters beyond imagining who are doubtless scheming to bring about the downfall of all landmasses so that their abhorrent kingdom of Darkness and Drowning may reign supreme across the face of the Earth. However, once you get past the whole "I don't wanna die" thing, I always find looming tendrils of doom to be quite fascinating. These ones are particularly interesting; I have never seen such exceptional looming. And they're laden with more doom than one of those donkeys carrying more hay than strictly possible. The Bigfin Squid was first discovered as early as 1907, when a juvenile was pulled up by a trawler in the Atlantic, not far from Europe. Unfortunately the corpse was so battered that while it was recognised as a new species, they didn't realise quite how new it was. They thought it was a kind of Whip Lash Squid, which all live in the deep sea and are sometimes known only from the battered corpses of juveniles. "The tentacles have, among other things, been twisted and broken, and it is impossible to measure their length." Another youngster was dredged up in 1956 but again, little was thought of it. Not until the fancy technology of the 90s and 00s did things really get moving. I guess it took about a century for us to realise just how horrific things could get. Thing is, there are two separate lines of inquiry. One is to do with the youngsters. A Young Bigfin Squid. It has a big fin. 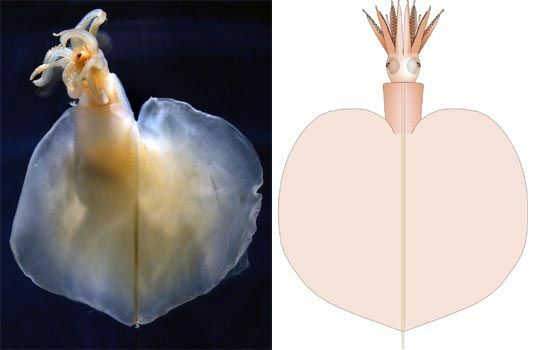 When two more juveniles were captured, they was compared with the previous two specimens and at last, in 1998, the Magnapinna genus and the Magnapinnidae family were born. These had unremarkable arms, but gigantic fins that were almost as long as the mantle. 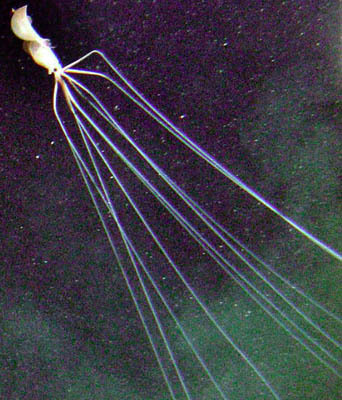 These are the Bigfin Squid. The other line of inquiry are what seem to be the adults. Living at depths of over 2,000 metres (6,500 feet), they have never been caught so we can't be totally sure they're the same as the juvenile specimens. We've seen them, though. What a sight they are. They have what seem like the same gigantic fin, which shivers in the dark as the spectral creature slowly makes its way across the featureless abyss. Forever facing downward, they end in arms like spider webs which delve into depths ever more unfathomable. They look like unholy puppet masters, or a labour saving device for the proactive tyrant with so many people to hang, so little time. These are the Long Arm Squid. They are also known as Elbow Squid because they have strange elbows where their arms bend at almost a right angle. Another unique characteristic is that all their arms and tentacles appear to be identical to each other. Other squid have 8 arms and 2 extra-long tentacles, the Long Arm just has 10 extra-long limbs. 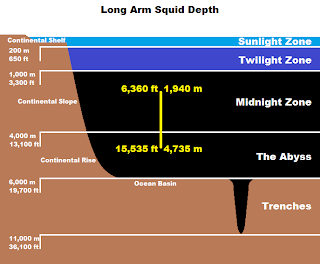 All in all, Long Arm Squid have been estimated to have a total length of at least 8 metres (26 ft). This is when the arms are fully stretched out. When an escape response was elicited, it turned out they could be contracted to a great extent. "You may have won this round..."
It's not known how these arms are used. Perhaps they're dragged across the seafloor, grabbing any edibles they come across. Or perhaps they are just left suspended in the water column, awaiting any morsels who get too close. Whatever they're doing, they're not bad at it. Long Arms have now been spotted in the Atlantic, Pacific and Indian Oceans. From examining the youngsters, there are currently thought to be 5 known species. It's difficult though. That first specimen from 1907 is the only example of one particular species. Another is known from three specimens, one of which was retrieved from a fish's stomach. And of course, they are all immature individuals with a mantle less than 10 cm (4 in) in length. What they have to do with those spindly phantoms of the deep is deduced but uncertain. 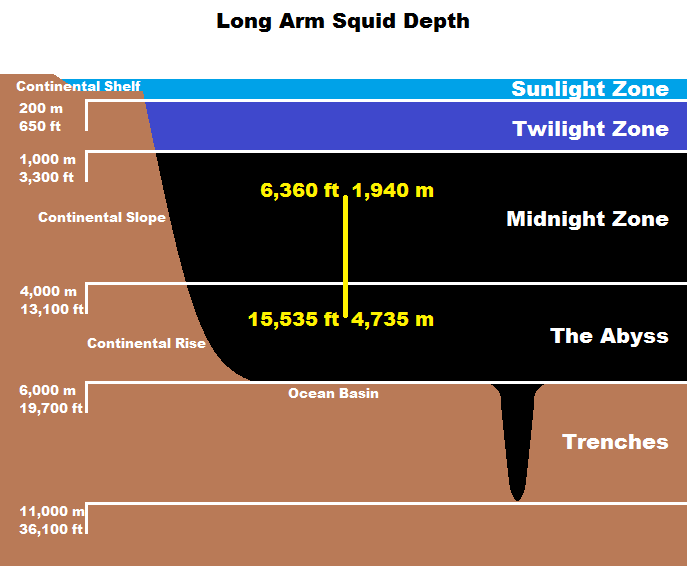 I would say the Long Arm Squid holds its cards close to its chest, but I'm not quite sure they can do that. The enigma continues nonetheless. Now this is what an alien should look like! People are looking towards the skies, wary of UFOs but they do not realise that they are already here and are hiding below the surface! Yup! You don't need other worlds when ours has things like this!